It was love at first fit. 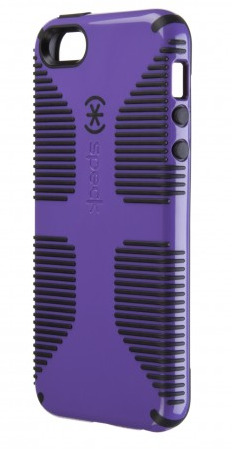 The second I slipped my iPhone 5 into Speck’s $35 CandyShell Grip, the case was destined to become a favorite. The CandyShell Grip is made for butterfingers and frequent texters who are prone to dropping their iPhone, and gamers who need to be finger-fleet with onscreen button controls. But I fall into none of those categories, which proves that the CandyShell Grip is great for just about anyone. This form-fitting case adds practically no bulk or heft to your slender aluminum and glass powerhouse. Its interwoven plastic and rubber gripping bands, finger pads, and thumb bumps make it easy to grab your iPhone from a pocket or purse, while the design naturally guides your fingers to the iPhone’s sides, which means less smudging of the iPhone's bright Retina display. The CandyShell Grip is one of many mobile device cases that feature Speck’s shock-absorbent, dual-layer, two-in-one hard/soft construction. The exterior is a glossy plastic shell with silicone ridges on the back and sides. The inside, which lines the back of the iPhone, is a softer silicone material. A raised bezel just slightly overlaps a tiny part of the front of the phone, while rubberized press-through button overlays shield the iPhone's volume and Sleep/Wake buttons. These button overlays are made of a flexible material, so the Sleep/Wake switch is easy to click and the volume buttons and Ring/Silent switch are easy to operate. You don’t want to drop your iPhone, of course—and this case offers no protection for the glass if you do—but it's designed to minimize the chance of losing control of your device while you're moving around on the street or subway. And if you place it facedown on an available surface, that bezel raises the iPhone ever so slightly above any potentially damaging surface. Whether you consider yourself stylishly chic, a full-on nerd, or someone who just needs to see a dash of color in your life, you'll appreciate the variety of bright, two-toned color combinations. Two black shells with a subdued contrasting gray or dark red color join two white shells with black or blue contrasting grips. Deep blue, pink, purple, and yellow shells also sport pleasing secondary or black color combinations. Note that if you want to charge your phone with the case on, you'll need to use the Lightning cord as opposed to the 30-pin to Lightning adapter, as the case does not accommodate the width of the adapter. Having Speck's CandyShell Grip for iPhone 5 on your iPhone feels like having nothing at all, but this featherlight case helps you maintain control of your device while at the same time offering great-looking protection.